The film Wonder is based on a New York Times bestselling and award-winning novel of the same name written by R.J Palacio. The novel Wonder was Raquel’s debut novel, and came about from a real-life experience. She was taking her son’s out for ice-cream, she was waiting outside with her 3-year-old in a stroller whilst her older son gathered milk shakes inside. Sitting next to them was a young girl who had severe craniofacial difference, she was with her mother, when her young son saw the little girl he started to cry very loudly, scared by seeing something he wasn’t used to. In that split second her first thought was to leave so as not to upset the little girl, but in the commotion of the moment she caused her older son to spill the milkshakes and chaos ensued rather than a planned discreet exit. As she walked away she heard the mother say “Okay, guys, I think it’s time to go,” and for the rest of the day she couldn’t shake the sentiment that the mother and daughter probably played out the same scenario countless times a day. At the end of the day she had panicked, and felt she didn’t have the wherewithal to know what the right thing to do was. That evening, still pondering the day’s events the song Wonder came on the radio (by Natalie Merchant), and a seed was sown to write a story. The book was aimed at children, albeit read through an adult, but the film will now bring the theme to a much wider audience. The movie tells the story of August Pullman, his family affectionately call him Auggie. He was born with a facial deformity, by age 10 he has already had 27 surgeries, which have helped him to hear without a hearing aid, to breathe and to see. But he still looks different to other children. His parents are played by Julia Roberts and Owen Wilson, understandably they are very protective of their son. Up to this point he has not entered mainstream school, but that is all about to change when he starts attending Beecher Prep as a 5th grader. School can be a challenge for even the most well-balanced child, but just how would Auggie cope with fitting in? At the beginning along with the support of the Director of the school (played by Mandy Patinkin), he sets about trying to prove he is just an ordinary kid, who happens to have an extraordinary face. Despite his appearance – he is just like them! As you might expect from such a heart-warming but difficult story there are emotional moments and scenes of bullying. But also, it demonstrates a journey of compassion, inner-beauty, humour and finally acceptance from family, teachers, the community and classmates. The young actor that plays Auggie is Jacob Tremblay and he really does steal the show. With lines like “It takes a lot of work to look this good,” when asked by a classmate have you considered plastic surgery? You can’t help but love and feel for him – he is an unlikely hero! 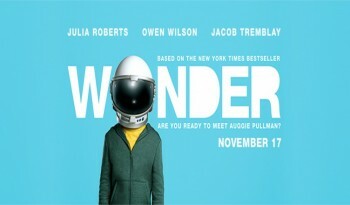 Wonder is directed by Stephen Chbosky who also wrote the screenplay for Disney’s Beauty and the Beast. Co-stars include Sonia Braga and Daveed Diggs. Wonder is released on the 8th December 2017 in the UK by Lionsgate in association with Walden Media and Participant Media.